Just one example of the kind of image that Waikato's Biological Imaging Facility can produce. 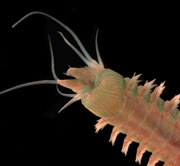 The Waikato Biological Imaging Facility offers a broad range of microscopy and photography services. A comprehensive platform for confocal laser scanning microscopy including spectral deconvolution, live-cell imaging and powerful post-processing software for analysis and 3D reconstruction. Conventional photomicroscopy including epi-fluorescence and all transmitted light modes. High resolution still, time-lapse and video imaging. Extended depth-of-field imaging using AutoMontage. Photomacrography, close-up and general technical photography. We use an Olympus Fluoview FV1000 mounted on an Olympus IX81 inverted microscope. Find out more about the microscope's technical specifications. More examples of the possibilities. The instrument is an Olympus Fluoview FV1000 mounted on an Olympus IX81 inverted microscope. There are three confocal detection channels, one filter-based and two capable of spectral scanning. A fourth transmitted light detector captures images in DIC or brightfield. The Fluoview software supports fluorescence separation by spectral un-mixing of fluorophores, colocalisation studies, FRET, FRAP, multi-point time lapse observations, 3-D reconstruction and various other experimental protocols. 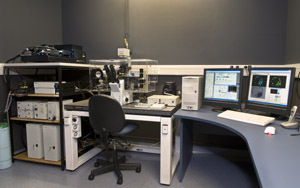 The microscope is equipped with conventional fluorescence as well as DIC and brightfield. The captured brightfield image is exactly aligned with the confocal image. In addition there is a SIM scanner allowing simultaneous bleaching at 405nm and scanning at any of the listed wavelengths. Sequential bleaching and scanning is available at all the above wavelengths. The fully-motorised stage accepts single conventional microscope slides (including Lab-Tek slides), Petri dishes between 35 and 100mm diameter, and the standard microtitre plates (85x128mm). The stage is normally enclosed by a 37degree incubator capable of perfusing CO2 through a variety of chambers. When the incubator is not in use the ambient temperature is precisely maintained, at 22 degrees. The facility includes a powerful off-line work-station for archiving and the post-processing of images. This is achieved using the image analysis programme Image Pro Plus which fully supports the Olympus file format. The full suite of IPP analysis packages is available including 3-D Constructor (which includes surface plotting) and the Sharp-Stack Plus deconvolution algorithms. Find out about Waikato's electron microscope facilities.